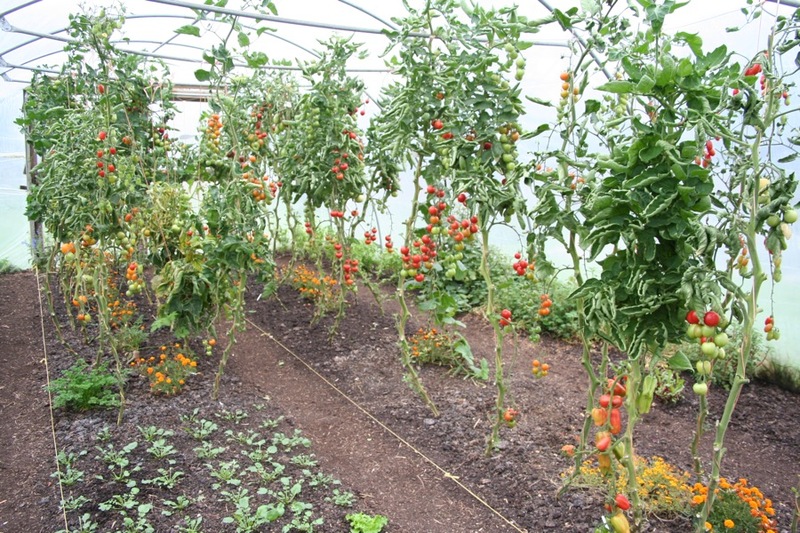 Polytunnels are wonderful structures and good value compared to greenhouses. Once erected they will be there for several years, so check out my tips before buying. 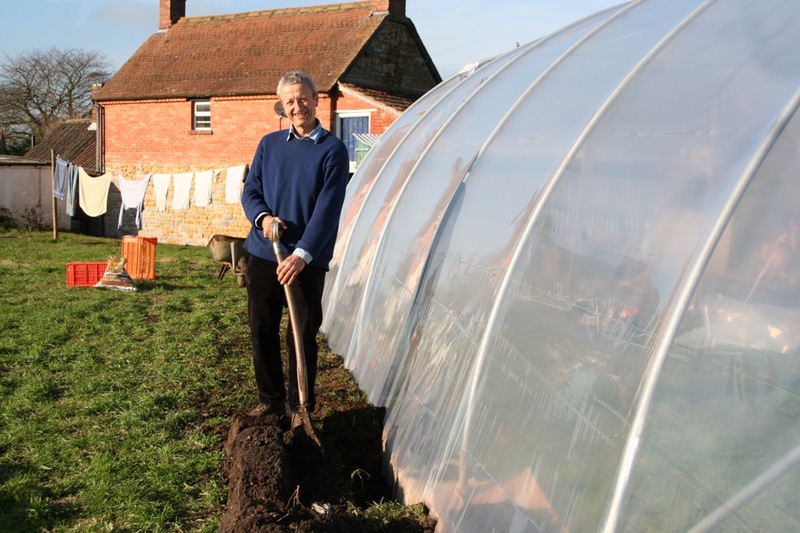 I have used polytunnels since 1983 when I bought 3 of 18×55 feet (5.5x17m) and they served me well except that their 1in tubes were a little too thin for my exposed site; in a gale of March 1988, one of them collapsed after the wind ripped out its polythene on the far side, see below for how that works. I would buy the largest you can fit into your area, because the space is useful for storage and drying washing as well as for growing! and one always finds more to plant in a tunnel. Hoops are usually 5 feet (1.5m) apart so length is multiples of that. I reckon that 20-30 feet is a good length for even ventilation, whereas tunnels of say 60 feet length can have pockets of ‘dead’ unventilated air in the middle. North to south is ideal so that tall crops in summer cause equal amounts of shade to either side, also to reduce overheating in summer. An east-west structure is face on to the midday sun and in a hot climate this is not ideal during summer. It also means some shading of crops in the north bed when summer crops grow tall in the middle. Plants like fresh air and its important they have enough, rather than striving for maximum heat. Air in a polytunnel circulates from one end to the other, and if possible I recommend leaving a gap between the top of doors and the frame above them, say 6in (15cm), so that a small amount of air can always flow through and increase carbon dioxide levels, without a draught at ground level. I find that winter salads stay healthy, without mildew problems, yet without any need to open and close doors for much of the winter. One job saved! The option of side vents (instead of the polythene going to ground level) is in my opinion not necessary or suitable for vegetables, because it reduces temperature too much in windy weather, and the doors offer enough possibility to admit fresh air. Its cheaper, simpler and more effective on other ways to cover the hoops with polythene only, to ground level and below. Keep side vents for long tunnels only, above a length of 40-50 feet (13-16m). Polythene attached at ground level, or buried? too much draught and cold air around plants’ leaves. It is sometimes claimed to be easier and quicker to attach polythene at ground level to battens or rails. But having tried this, I do not agree. because before doing that, you need to dig holes for the foundation tubes rather than simply knocking them in, also you may need some concrete in there for windy sites. All the fixings you need involve extra expense and are only worthwhile if there is simply no room to dig a trench. When burying polythene in a trench, tubes simply need to be hammered into the ground about 12-18in (30-45cm), where their role is to give the structure some rigidity, that is all. When polythene is bured, the tubes are not anchoring the structure in place, but keeping it steady in wind. In contrast to this, when polythene is attached to a rail and not buried, the foundation tubes have more importance as they are what holds the structure in the ground (rather than the buried polythene) and so you need more expensive tubes with metal brackets on their ends, and each one requires a dug hole, sometimes with concrete. While we were looking at this on one of my courses, a participant lamented how her new tunnel had blown away within a month – the polythene was attached to rails, rather than buried. Exceptions to the above are sheltered gardens, and sites where you cannot dig a trench e.g. too much gravel, concrete etc. But then it is difficult to dig holes for foundation tubes too. Although an “extra” I would always buy these, so you have support for climbing plants from tomatoes and cucumbers to beans and melons. They span across from side to side at about or just over 6ft (2m) high, so you can walk underneath, yet also reach to tie strings or stakes. How many years before re-cladding? Polythene needs replacing every 5-8 years, depending how windy your site is and how tight you can stretch it. Polythene is easier to make tight when the cover is put on in warm sunshine, if possible. I have often done it in January and managed alright, but the skin is definitely slacker and more prone to damage than when clad in warm sunshine. More types become available and choosing is then difficult. From tunnels I have seen with the more expensive thermic or anti-condensation polythene, I doubt that their extra cost is worthwhile. I recommend the standard, light-diffusing polythene which admits around 89% of daylight. Always use horticultural grade polythene, which has a uv stabiliser, without which it would be brittle and break within a year. A friend recently noticed the great clarity of my standard, light diffusing polythene which is now 3 years old. I had recently washed it with a wet sheet and brush to remove lichen and moss. You use these a lot so suffice to say, they are worth spending money on to have the ones you like. Home-made is certainly possible, note my tips on ventilation. Its the area where you can be most creative, especially if you enjoy carpentry. For door frames, 4×2. I am a beginner gardener and my allotment is not close to the house. Should I buy a tunnel or a small greenhouse (my garden as well as all the alotments around me have a rat problem that becomes more difficult in the winter and rat poison or traps are not 100% efficient)? The greenhouse would have glass walls, aluminum supports and a brick and concrete foundation on top of which we would put soil and compost in oder to keep rats out.